We know you know what Facebook is, but just in case you’ve been away since 2006: Facebook is the world’s leading social network with over 2bn global users. In the UK, there are over 30 million Facebook users. Facebook allows you to connect with family, friends, brands and whatever really takes your fancy. It is its own search engine so you can search for a lot of things in there too from news, items to purchase and of course look for homes from your local estate agents. Facebook is a community and likes to connect you to people and events local to you, and based on you and your audience interactions it will pick up people and events that you may be interested in. What this means for you as an estate agent is that you ought to become the digital mayor of your local area! You do that by being sociable. ‘Social’ is at the heart of all social networks, especially Facebook. They encourage the connection through valuable conversation - the type of conversation that your audience are interested in. 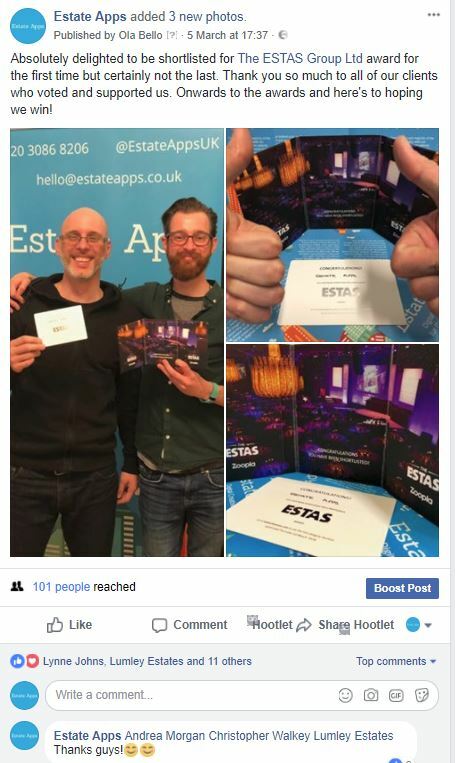 As an estate agency do I need a strategy to use Facebook? Yes. You can’t just ‘hit and hope’. With the major algorithm change at the start of the year to Pages, the organic reach is now far less, around 10%. Let’s say you have 100 followers, only about 10 will see your post. So you have to pay for the other 90 followers, and hopefully more, to see what you’ve posted. To create your strategy*, you need to define what your goals are on Facebook. For example, if you decide you want more people to like your page, you will still need to provide the content for your page that your audience will like and therefore will be engaged with. The advice we offer is to provide content that demonstrates your awareness of the local area and the expertise you provide as an estate agency. So your content should be inspiring, interesting and educational; therefore engaging. For example sharing posts from your connections where pets need new homes in the area, local charity events, things to do in half term with the children in the area. The rule of thumb is 80% sharing and 20% about you. Remember that being social is the heartbeat of Facebook, it isn’t meant to be used as a broadcasting tool. A vital point to remember is that you do have to have a Facebook business page. You can’t promote your properties and services on your personal profile as it is against Facebook’s terms of services. Bear that in mind, as they do have the power to shut down your account. *We will be sharing a follow-up blog post on creating a Facebook strategy, so do keep an eye out! What if I’m not ‘popular’? Facebook thrives off engagement and connection. The more engaging your posts are, that is, the more people are interacting with you the further up the timeline you’ll go. Keep an eye on your insights to see what posts are working for you and what aren’t. Regrettably brands and businesses will have to work that much harder at achieving the organic (not paid) engagement with your audience. As the algorithm is rolled out, it is increasingly apparent you will have to pay in order to play. We will discuss creating ads and boosting posts in another blog, but generally that’s the monetary side of using Facebook pages. Monitor your competitors and monitor those not in your industry. See what they are posting and check the engagement. We will be going into more depth over specific topics in Facebook such as Ads, Insights, Facebook Live and go into the types of content to share, so please do keep up to date with our latest blog posts. We hope you found this post helpful. If you need a hand with Facebook strategy please do get in touch.